Opera has finally lift the veil and introduced the "thing" that would reinvent the Internet. It goes by the name Opera Unit and will be a part of the upcoming Opera 10 web browser. Opera Unite basically offers web server capabilities right in the web browser which allows users to share data and files on the Internet but also to host chat rooms, online applications and even complete web projects. The main difference between Opera's approach and the standard approach is that Opera establishes direct client to client connections without data being hosted in the cloud on third party servers. Media Player - Accessing the music collection from anywhere on the Internet. File Sharing - A way of sharing files directly between users. Fridge - A note leaving application that other people can use to leave notes on a computer system. Web Server - Hosting a web server from the local computer system. Photo Sharing - Share photos without uploading them first. The Lounge - A chat interface hosted on a computer system. The Opera team has created a user guide to get users started with Opera Unite. Opera Unite is available as a separate preview release which can be downloaded for all supported operating systems from the Opera Labs website. The download will actually replace the current version of Opera 10 if the user decides to install it in the same installation directory. Opera Unite is then available in the left panel after installation. Starting the actual home server requires an Opera account. A homeaddress is assigned to every user signing up for Opera Unite in the from "http://computername.username.operaunite.com/" with the user selecting the computer name. The username will be the Opera username. Once that has been setup the service that has been selected by the user gets setup. Setup of the file sharing module for example requires the selection of a directory on the local computer that will be used for that purpose. Each service that has been activated can then be accessed from the created homepage if the user accessing it has sufficient rights to do so. The file sharing page on the server is for example protected by a password by default which can be changed in the root home directory. It offers three different access rights which make it possible to allow public access (everyone can access them), private access (only the root user can access the files) or password protected access. 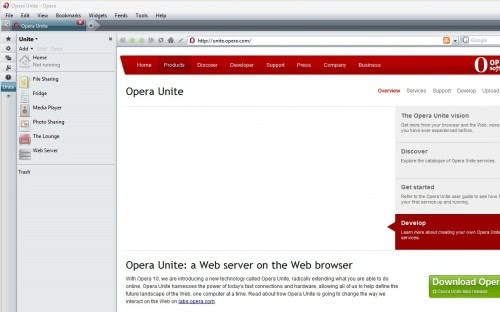 Opera Unite offers something that web browsers do not offer out of the box. The usefulness of the service on the other hand depends largely on the user's system configuration. If the user runs an home server then it might not be needed to run Opera Unite as well. Users who prefer to access everything from one program might find Opera Unite helpful especially if the developers and users begin to add new modules to the service. Not really a reinvention of the Internet but a nice service nevertheless. opera continue to lead the way. So, now who is betting that when mozilla do this (it’s only a matter of time, after all, where would we be without browsers copying each other?) everyone will praise them for their innovation? Is it just me, or does it seem like Opera are setting up the framework for a social platform built into the browser? Another great idea by a great company. Skeptical on this one (coming from diehard Opera user). Writing post for later today. In short I don’t believe this is something browser should do or something that can make impact on global web scale. Social platform? Imagine all your social profiles vanishing from web the second you turn PC off. Imagine no one can send you message/email unless your browser is running. I was never a fan of leaving my computer or any software on for extended periods of time but this may be a nice substitute for those who need to use HFS and some other server together. My media centre is on perm anyways and i wouldn’t mind it serving up the TB or so of mp3s so i can listen at work. question is when trying to listen to a shared media folder do you have to use opera as i cant seem to get the page to work on my first attempt here at work. says item is not available even though it is and there is not pwd? I think theory is that any browser should be able to visit Unite Service as client (as it can regular page). Will it really work that way and with all Services is questionable at moment. You can pick ready-made button from my post I linked to (or elsewhere it has further link). And it’s more like a lot of Opera features are unobtrusive to the point of shy. Interface customizations in it are very powerful but require some serious tinkering and googling most of the time. – get rid of bittorrent ability completely, it’s annoying to have to disable with crude hacks. Seriously, who uses this “functionality”? – fix that obnoxious memory usage! (Chewed up 180MB+ just to open it). Re-invent the Internet? Try re-inventing your browser first, guys. Also, do we REALLY want just anybody making websites? Think of the worst Myspace you’ve ever seen while you ponder this, heh. I do, there is no point to install new app just for few mb file. What crude hacks? Associating torrents with whatever you want is few clicks in Opera settings. If your Opera uses 180Mb on blank launch than there is something seriously wrong with your installation. Which is not uncommon if you changed versions without clean reinstall. I am using Opera since morning, have dozen tabs open and it currently consumes 80Mb. based on original Firefox Allpeers addon? I had to consult Wikipedia so may not be accurate. Allpeers was torrent-based and relied on central server much more than Unite seems to. I didnt mean a facebook-esque social networking site. I was thinking more of it eventually either integrating a current instant messenger or developing its own (no doubt the APIs will make good use of that) and then taking a few steps beyond that. Exactly what beyond that? I have no idea. As i said, its the framework for a social platform. I think it will be in development for a few years before we really start to see Unite shine. Yep, I got you don’t mean it that literally. Still communication method is not viable if node goes dark as soon as browser shut down. Unite seems to be explicitly designed to be as much server-independent as possible. I agree it will take some time to see what comes of it. Wrote “brief” post on it – almost thousands words, heh. Will edit and get it live later today. well i think Opera Unite is another great idea opera. nevertheless, soon, and very soon, …. all other browsers will copy this Brilliant IDEA…. uTorrent is much better at the job, and I’ll bet much more efficient. I’d love to hear how much RAM Opera chews on while dealing with 10 or more torrents running at the same time. This is why I find it to be a silly feature, but i guess it gets the newbies feet wet? I’d rather have something not present than have to disable it: the feature’s code is still unnecessary (imnsho) and taking up space. I meant by “just anybody” that (I’m assuming here…look out!) this aspect of Unite will enable even those without the intelligence to use the simplest of WYSIWYG interfaces currently available (the ability) to build websites. Since they are getting past the whole “intelligence filter”, the sites will surely be atrocious, on the average. Snobbery, I guess, but some things are best left with a degree of difficulty that makes it prohibitive to those who likely have no asthetic sense or concept of inoffensive web design. Again, Myspace. I will say kudos for not forcing the whole package on everyone. At the very least, it has a modular design going for it. Also, admittedly, I am basing my bias on an older build. I never installed more than the version I tried…the concept of updating requires some loyalty beyond a casual testing, after all. I will try a newer version though; it seems only fair given this new info, and the fact that I stuck through Firefox 2.x heh. As I type this, I am using the latest Firefox with no less than 37 addons installed. It consistently uses 92MB with a single window, and uses ~102 with multiple tabs (I never use more than I’d say…10 tabs). I never thought I would install so many addons, but the performance has been great and there REALLY is no reason to scale back since it runs like a Swiss watch! Nothing I’ve tried compares, that simple. Who cares? It’s much easier to NOT install uTorrent, it is much more user friendly NOT to open a new program for torrents. And don’t forget, there are five billion people who don’t even know what a torrent client is. Why should they waste their lives on looking up such irrelevant information? There is FTP support in all browsers, people used to compain about that too. Torrents really are just another protocol to support. So that people don’t have to search up info on what client that is the most efficient and does the best job. Nobody really cares until they have to. They consider their free time more important than download efficiency. Nothing I see makes me want to switch off Firefox honestly… To me all they have done is stuck a webserver with some toys into the browser, I don’t really care about that. id rather setup my own and have the control over it (Plus it would support PHP, which I do the PHP backend on websites, so id have more options). 2) Security issues. You now have browser and webserver security, furthermore the security of the users computer itself might come into play. Hosting, it’s not expensive, get it instead. Still for average user few clicks in browser to share some photo is easier than purchasing hosting or running own WAMP stack. It’s not really “if this is useful”, more like “it will be there so if anyone will use it”. Thanks for the good news, I don’t think setting up a regular web server as we understand right within the browser is a good idea but the file sharing and social features might be awesome. Can’t wait to try that out. – Gotta disagree with that one, crudely. Changing the default setting inside Opera is a no-brainer. Great idea! Opera leads the way again. On April 24th, Opera Software (Alliance) made the decision to start sunsetting Opera Unite and Opera Widgets. This has started an uproar and feel of betrayal as many users are taking advantage of these amazing tools. The solution could be as simple as converting the interface to Open Opera United allowing a user to download the file from a community controlled environment outside regular support. Help us convince Opera we really love our tools and would be sad to see them go. Help us get the word out and share this with everyone. We must hurry, before the next release of Opera will be removing these tools from our ability and use.